Forever Fast Break Energy Bar is great meal replacement for today’s "on the go" lifestyle, and an ideal way for active individuals to keep up in a fast-paced world. Provides many of the vitamins and minerals our body needs everyday. Great as a snack or meal replacement. Only 230 calories per bar. A great-tasting, low-calorie alternative to skipping meals, each Forever Fast Break Energy Bar provides many of the vitamins and minerals our body needs everyday. Phosphorus enhances energy levels by speeding up the metabolism of fats and carbohydrates, thus helping the body recover from over-exertion. Potassium is not only essential for proper cardiovascular system, nervous system and muscle function, but it also helps to ease mental and physical stress. Forever Fast Break bars can help control weight as part of a calorie-controlled diet and exercise program. 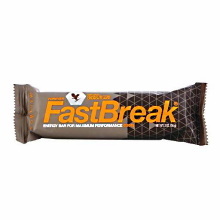 Replace no more than two meals daily with Forever Fast Break Energy Bars. A third, well-balanced meal should be eaten.